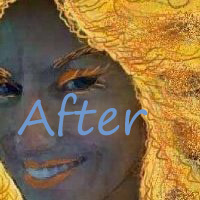 Take a photo & PhotoShop & make a fantasy being that looks like you! More coming soon! 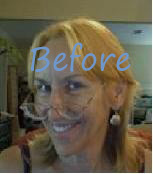 Here are some before & after pictures of me. This is a low quality camera so the resolution was poor but I was still able to do something with it since I am an artist, not really a photographer. 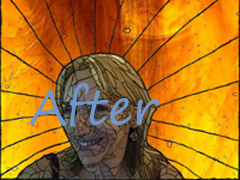 Fire Goddess & Stained Glass Rendition. 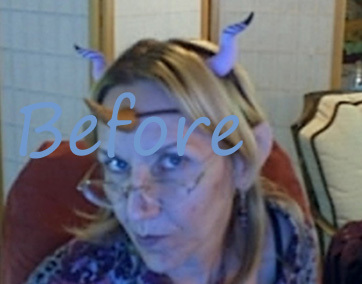 This one I was at Texas Renaissance Festival where I bought elf ears, faun horns & a unicorn horn. 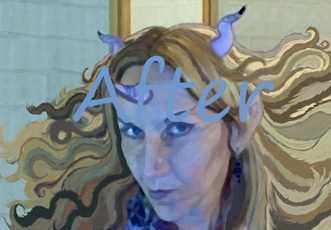 I edited out the thong for the unicorn horn, changed the color & made it into a painting. This picture was again a webcam shot. Copyright © 2010-2015 Eliza(Beth) Smith. 281-250-4176 All Rights Reserved. Please call but NO SOLICITING! I get spam so no longer offer an email to contact me. But you can contact me in Facebook. See my link.